"Luna y Marte", an exploration of Andalucia’s vibrant culture, brings highly experienced dancers, musicians and singers together for a fiesta to remember. 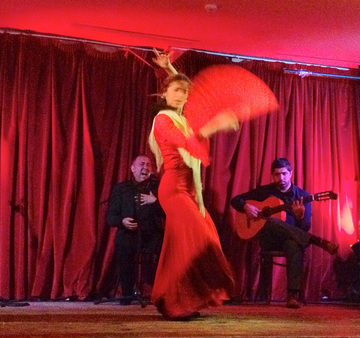 An unmissable Flamenco show featuring Spanish guitarists Javier Mula and Javi Campos, Jose Camacho, dancer and percussionist, and Fatima Lucia, dancer and vocals. Fatima, from Cadiz (Spain), the spiritual home of Flamenco, is the leader and director of 'Al Andar', dedicated to conveying the unique sensitivity and passion of this tradition. Fatima was the first Flamenco teacher in Ireland and has been teaching Flamenco dance in Galway since 1993 when she settled here. As Al-Andar, she has been inviting artists from Spain for the last two decades, successfully touring Ireland in many occasions. Amongst her previous guests are Felipe de Algeciras, Olayo Jimenez, Pedro Viscomi, Joni Lande "er Nano", Curro Luna, Juan Hernando, Ornelia Gulisano and Pepe Vento. Venues include: National Concert Hall (Dublin); Town Hall Theatre, Roisin Dubh and the Black Box (Galway); Siamsa Theatre (Tralee); Linnen Hall Theatre (Castlebar); Markree Castle (Sligo); Glor (Ennis); Crane Lane Theatre (Cork); University Concert Hall (Limerick), and various Arts Festivals. In the past few years Fatima has toured Ireland with first class Irish musicians such as Sean Keane, Martin O'Connor and Arty McGlynn, combining Sean Nos with Flamenco (appearing as solo dancer on Sean Keane's latest DVD 'The Irish Scattering').